Easy homemade toilet bowl cleaner is a natural and effective way to clean toilets. 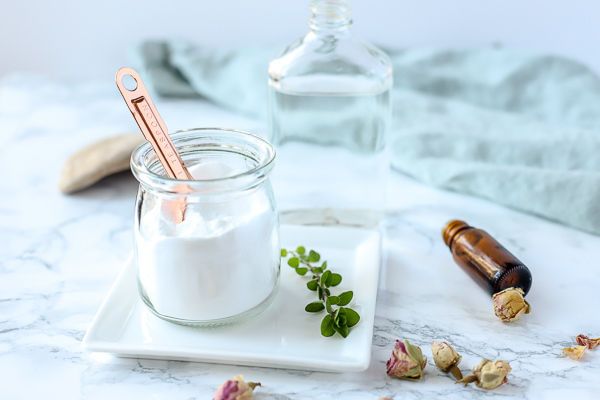 This DIY toilet cleaner costs only pennies to make and you can feel good about the products you are using in your home. Follow my tips below to making this easy recipe. Toilets are gross! Can I hear an amen? I really hate cleaning them! You know what makes them extra gross… boys. I got two of them and one isn’t even peeing in the potty yet and I’m mentally preparing myself. My husband is like the cleanest man in the world, next to my dad, and somehow it is still gross. But it has to be done and I don’t want to use toxic cleaners! What is one to do? Create a natural and effective homemade toilet bowl cleaner of course. I’ve been using this recipe for years and have finally had the chance to share and update it. I really wish I could or would have calculated how much money we have saved over the last 8 years by creating our homemade cleaning products. That doesn’t even count all the toxic chemicals we have avoided over the years. But seriously, the savings has probably been in the thousands of dollars. With just a handful of natural ingredients we can clean the house top to bottom. From our natural all-purpose spray to this simple three ingredient window cleaner, you can do so much with basically the same ingredients. Why should you make your own toilet bowl cleaner? Conventional toilet bowl cleaners are full of harmful chemicals and fragrances that are not only unhealthy for you, but also the environment. Every time you use one of these chemicals you are flushing the toxic chemicals down the toilet to pollute the environment and our water systems. Get a good toilet brush for cleaning, it can make a huge difference. Use anti-bacterial type of essential oils like On Guard. Let the homemade toilet bowl cleaner sit in the toilet for a few minutes to sit. I like to add it to the toilet, then clean the rest of the bathroom, and then clean. Use this along with my DIY all-purpose cleaner to get the whole bathroom sparkly. How do you deodorize a toilet naturally? Baking soda is an amazing deodorizer. Simply spring baking soda into the toilet bowl and allow to sit for 10 minutes. Spray with all-purpose cleaner on the outside and on the inside of the toilet. Scrub toilet bowl with brush and wipe down rest of the toilet with a paper towel or reusable cloth. Make sure to clean the inside underneath rim of the bowl. Allow the baking soda and vinegar mixture to sit for a few minutes before scrubbing for extra deodorizing power. Add essential oils to help disinfect, remove odors, and make it smell prettier. The brush can make a big difference. Make sure to get a nice toilet brush that scrubs well. You can also make a liquid version following my recipe below. For the biggest bang for your buck get your baking soda at like Costco or Sam’s Club. Love natural cleaning products? Try some of our favorites..
DIY Furniture Polish – with 3 ingredients you can clean and protect your wood surfaces. Homemade All-Purpose Cleaner has been my go to for years. DIY Glass Cleaner… coming soon. Learn how to clean your home naturally with these 15 tips. If you don’t want to DIY, my favorite non-toxic cleaner is Branch Basics. Directions: Sprinkle baking soda around the bottom of the toilet bowl and on the really dirty spots. Pour in vinegar and leave for a few minutes. Scrub with your toilet brush and flush. How do you make liquid toilet cleaner? Mix together baking soda, natural dish soap, essential oils and water. To use: Place in squirt bottle and squirt into the toilet. Add hydrogen peroxide or vinegar (don’t use vinegar if using castile soap). wait a few minutes and then scrub with a toilet brush. I Love using this, it cleans it really good.. I recently made all propose cleaner using baking soda, vinegar and water, just love it. I was just thinking to myself, “How can I use baking soda to clean the toilet?” when I was scrubbing it today. Thank goodness you came to my rescue!! Thanks a bunch for this. Off to pin it! So glad I could help! Thanks for pinning it! Thanks for sharing this green cleaning tip. Sometimes I use just sprinkle a bit of borax in our toilets then clean with brush. Wha La Done. O thats a great tip thanks Paula! Thanks for the invite! I just linked up! Well yesterday! Thanks for sharing on Tout It Tuesday! Thank you! At our house, I clean the “big bathroom” and my youngest son cleans the “water closet”. Even though I was buying the “green” toilet cleaner I thought there would be a better option but haven’t gotten around to trying any out. I will be doing this tonight for sure. Its good that you are using a green cleaner. I bet this option will save you lots of money! Thanks so much for the tip. I get so tired of cleaning with harsh smelling chemical filled cleaners. I will definitely be doing this from now on. No problem! Yea I hate that too and this solves the problem! 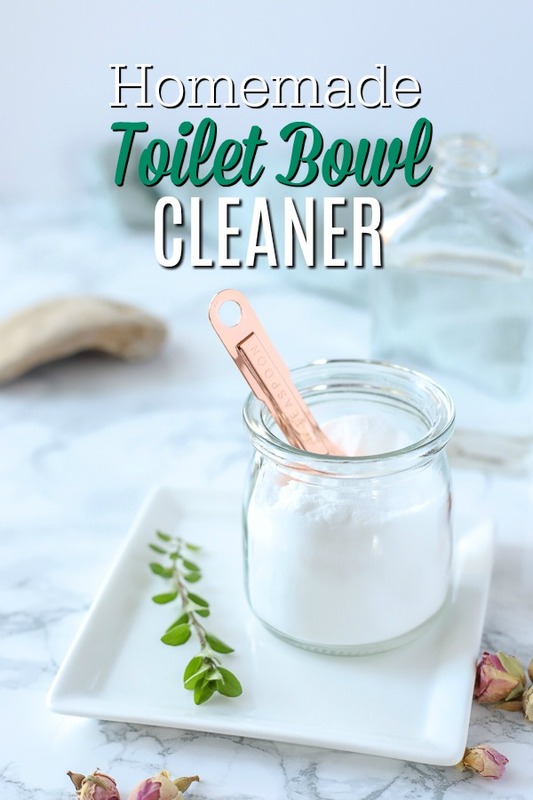 If your toilet bowl is a bit more than dirty, you can pour in about 1/2 cup of baking soda and add 1 cup of HOT white vinegar (I haven’t tried it with apple cider vinegar, but I guess it must work just as well). It will foam for a while. Let sit for about half an hour and scrub. Removes stains really well. OOO thats a good idea I will have to try that thank you!